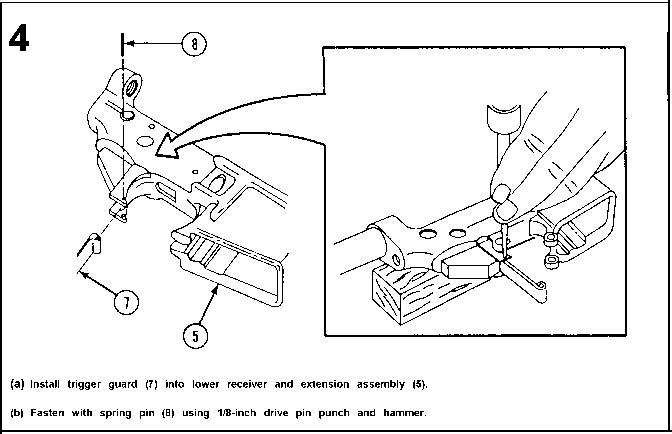 This chapter contains information and instructions to keep auxiliary equipment used with your weapon in good repair. Section I. UNIT AUXILIARY EQUIPMENT 4-1. GENERAL. This chapter covers Unit and Direct Support Maintenance of Auxiliary Equipment. (1) Bayonet-knife M7, NSN 1005-00-073-9238. (2) Bayonet-knife scabbard M10, NSN 1095-00-223-7164. (3) 40-mm Grenade Launcher M203, NSN 1010-00-179-6447. (4) Low Light Level Sight (front), NSN 1005-00-234-1568, Low Light Level Sight (rear), NSN 1005-00-071-8015.